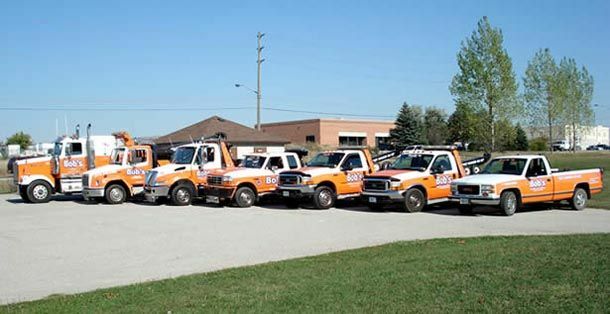 When you need a tow truck in Guelph and the surrounding areas, make Bob’s Towing & Recovery your first call. We’re a professional emergency roadside assistance and towing company that has offered 24/7 towing services for 37 years. Immediate repairs might not be possible on the spot – in fact, they could be dangerous out on the side of a heavily traveled road - but our prompt, reliable tow trucks provide a safe option. We’ll tow you back to a garage or other location to get you off the road and safe. We pride ourselves on our fast response times, courteous drivers and excellent service. As a family-run business with connections to the Wellington County community, our customers have come to rely on our promptness, expertise, honesty, fair rates and excellent customer service. No matter the size of your vehicle, our well-maintained equipment and experienced professional drivers can haul anything from a classic car to a semi-truck. We also serve all police agencies, and have a secure and monitored pound and facility. Don’t let car troubles leave you out in the cold! Give us a call when you’re stuck in a rut.